When I play an artifact, at what point do I steal the Æmber? The Æmber is stolen after gaining any printed Æmber bonus under the artifact’s house symbol, but before any “Play:” abilities are resolved. 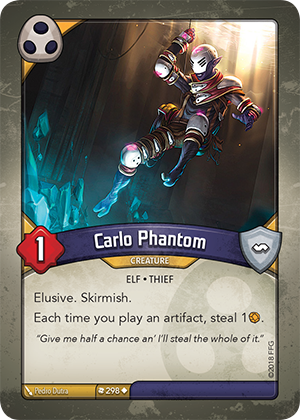 What happens if the owner of Carlo Phantom plays an artifact and their opponent has no Æmber to steal?